How did they think of …? I heard … was invented by … Is that true? Did they really used to make … out of …? Who really invented the … ? I heard the … was originally made to … Is that really what happened? What was the first … patented? 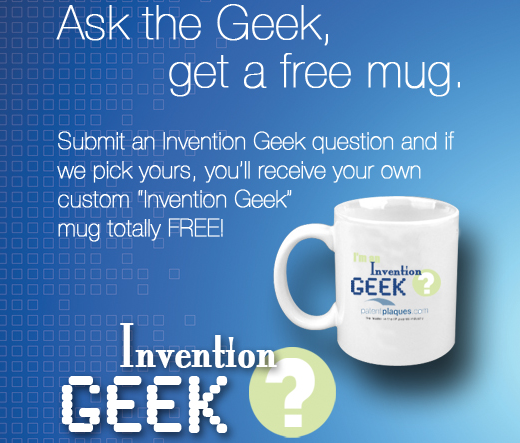 If your question is chosen, not only will we publish it in our weekly Invention Geek column, we’ll also send you a free one-of-a-kind patent mug custom pressed with a picture from your invention* and the title of Honorary Invention Geek. Want in on the fun? Ask The Invention Geek Now! *Rules & Regulations: No purchase is required to participate. Must be 18 or older at the time of submission to be eligible for prizes. Questions must be submitted using the form above or by sending an email to directly to inventiongeek@patentplaques.com. Participants may submit as many different individual questions as they’d like, but only one free mug will be awarded per participant per 120-calendar-day period. A valid email address must be included with each submission. Email addresses will be used for contacting winners for shipping information as well as notifying winners of the publish date of their question & answer. If you choose to opt in to our email newsletter as part of this process, your email address will be used for that purpose as well. Email address and personal information will be used only for the described activities and will not be rented, sold, traded, or otherwise shared except where mandated by law. Due to the volume of submissions, only winners will be contacted. Prizes must be claimed within 120 calendar days of article publish date. In the event the email address of a participant becomes unreachable or invalid, the prize will be held for 120 calendar days from the date the question is published. Prize has no cash value or cash equivalent. When available, the “picture from your invention” will be an image or claim from the patent or trademark application or issued document. In the case where no official USPTO document is available, an image related to the invention or its inventor will be included instead. Prize mugs are custom printed to order and will be shipped within 7 days of your question’s publication or confirmation of your shipping address, whichever comes later. Contest and associated prizes are void where prohibited by law. For additional questions, please direct them to inventiongeek@patentplaques.com. By submitting your entry you recognize you have understood, agreed to, and complied with these rules. Pingback: Patent Plaques, Patent Cubes, Patent Awards, IP Plaques, IP Cubes and IP Awards » Blog Archive » Invention Geek – Theremin? Pingback: Patent Plaques, Patent Cubes, Patent Awards, IP Plaques, IP Cubes and IP Awards » Blog Archive » Invention Geek – Levi Strauss? Pingback: Patent Plaques, Patent Cubes, Patent Awards, IP Plaques, IP Cubes and IP Awards » Blog Archive » Invention Geek – First Patent for Bottled Water? Pingback: Patent Plaques, Patent Cubes, Patent Awards, IP Plaques, IP Cubes and IP Awards » Blog Archive » Invention Geek – Seat Belt Invention? Pingback: Patent Plaques, Patent Cubes, Patent Awards, IP Plaques, IP Cubes and IP Awards » Blog Archive » Invention Geek – Eminent Domain? Pingback: Patent Plaques, Patent Cubes, Patent Awards, IP Plaques, IP Cubes and IP Awards » Blog Archive » Invention Geek – Who Patented the MRI Machine?